Kharma is a hyper-cog, which means she has telepathic and telekinetic abilities. She also has short-range precognitive powers, allowing her to see a few seconds into the future at any given moment. Her superior agility and gymnastics skills, combined with her cognitive abilities make her a very formidable combatant. Popular does not even begin to describe Kharma Halliday’s status on the campus of Emory University. During the first semester of her first year she ran for freshman class council president and won in a veritable landslide. To say she had the gift of gab is an understatement. She was an oratory master! She could captivate an audience with exciting and thought-provoking anecdotes; she could move a crowd with exhilarating and groundbreaking ideas; she could send a group of friends into hysterics with the perfectly told joke; she could gain the trust of strangers with well-balanced approaches to complicated issues; and she could ingratiate herself to people who vehemently disagreed with her viewpoints, thanks to her empathetic tendencies and reasonable disposition. So yeah, she was having a great college experience. However, when she joined the Pink and Black chapter of the Gamma Phi Delta sorority, that was when things really took off! She quickly became friends with her pledge class – Crystal Spears, Alexis Deville, Rivcah Patterson, Tiffany Griffin and Ja’Nique Prescott – and the six of them proceeded to pretty much take over the school, mainly because they were the most incredible step/dance team that you’d ever seen in your life. They began calling themselves the Sista Clique and were asked to perform at every college party, every basketball game and football game, every festival and even at events that took place at other schools. Soon, Kharma and her homegirls were being called in to give seminars and lessons to other step teams in the region and eventually professional sports teams began asking them to train their dancers in some of the revolutionary techniques that Kharma had created. She was hired to choreograph routines for the music video dancers of some of the biggest artists in the country and by the time she graduated she was being recruited by modeling agencies, talent agencies, dance companies and Cirque du Soleil. And she did all of this while holding down a 4.0 grade point average in pursuit of a degree in Metaphysical Sciences (i.e. the study of people with powers). She had planned to become one of the foremost experts in the field, however, during a trip to Las Vegas for a Metaphysical Sciences conference, organized by noted expert, Simon Charles, she straight-up fell in love with the the fast-paced excitement of the city! After graduating with her B.A. she entered grad school and tried to stick to her plan, but after a year of sitting in lecture halls and libraries, she just couldn’t shake the desire to move to Vegas. And it just so happened that the hottest new casino on the Strip – The Carnival de’ Carnel Casino and Hotel – was in need of a new hostess and lead dancer for their main floor show. Kharma secured an interview and audition with the casino’s CEO, Ray Carnel, and easily landed the job. She took on the name “Kharma Lucky” and proceed to revolutionize the Carnival’s main floor show. Carnel’s Celestial Creatures were now the most respected and most spectacular performance troupe on the Strip and, some would say, in the country. After a few months, she and Ray also became romantically involved and were soon regarded as a power couple in Vegas. For nearly two years, their relationship was amazing. It was the circumstances of some new business dealings that first contributed to the notion that things were about to change. Ray Carnel formed a partnership with Universal Intelligence: a company that specialized in the integration of artificial intelligence into a multitude of appliances and technology. It was run by a ruthless business woman, Reina Valencia, and owned by an even more ruthless businessman, Edgar Lockhart. Reina contributed lots of money, resources and technology to the Carnival, but in return she made harsh demands on Ray’s time, resources and energy. He was required to personally host particular events and clients; he was ordered to close down his casino for days at a time to accommodate Universal Intelligence parties for just the twenty top execs in the company; and he was forced to commit his personal team of tech and science geniuses to the research and development of secret projects that Reina had to keep off the books of UI. It put a bit of a strain on their relationship and Kharma would often suggest he stop dealing with Reina and UI. But he promised her that he was okay and that he could handle it. Well, that all changed, when Reina and Edgar came blowing into town one weekend, making their biggest demand yet. Ray was supposed to deliver a hyper-serum his team had been working on, but had failed to perfect. On the same weekend, Kharma had invited her Sista Clique homegirls to Vegas for a bachelorette party to celebrate the impending marriage of Alexis to her sweetheart and professional wrestler, Ronnie “Torpedo” Jones. Kharma was happy to have something to take her mind off of her relationship, as the six of them had a blast. After hours of partying and playing casino games, they made it back up to their room. There was a fresh bottle of champagne waiting for them. They popped it open and toasted it up, then fell asleep. But there was something different about that particular bottle of champagne. It had been in the hotel suite of Ray’s brother, Victor Carnel, just a few hours before. Ray and Victor had a very rocky relationship and Vic had been hiding the knowledge that he’d developed a powerful hyper-serum for some time. Through a wild set of circumstances, Vic ended up at the Carnival with the hyper-serum. But before Ray and Reina could get their hands on the serum, he poured it into a bottle of champagne and resealed it. Ray’s goons captured Vic, and searched his suite, but could not find what he was looking for. So the housekeeping team was sent in to make the room ready for the next guests and the “unopened” bottle of champagne ended up back in the hotel kitchen cooler. When an order from room service came through for the Sista Clique’s suite, it was that bottle of champagne that got picked up by the server and delivered to the ladies’ room. Kharma, of course, was the one to give the toast, and then the six of them drank the whole thing. The next day Kharma awoke to a horrifying sight! She and her friends were all writhing in pain and screaming in agony as their bodies were transforming! Then suddenly something more horrifying happened as a rush of memories, random voices and visions flashed before Kharma’s eyes – including a vision of her boyfriend and a group of goons coming through their hotel door, hitting her and her friends with tranquilizers, and kidnapping them. When that exact scene played out just moments later, Kharma realized that she had gained telepathic and precognitive hyper abilities. Down in Ray’s secret lab, beneath the casino – while Ray had Kharma and her friends trapped in energy shackles – the two of them had a huge argument and, quite obviously, broke up. Ray then attempted to use a mind control device to transform the now-super-powered Sista Clique into his own personal team of bodyguards. 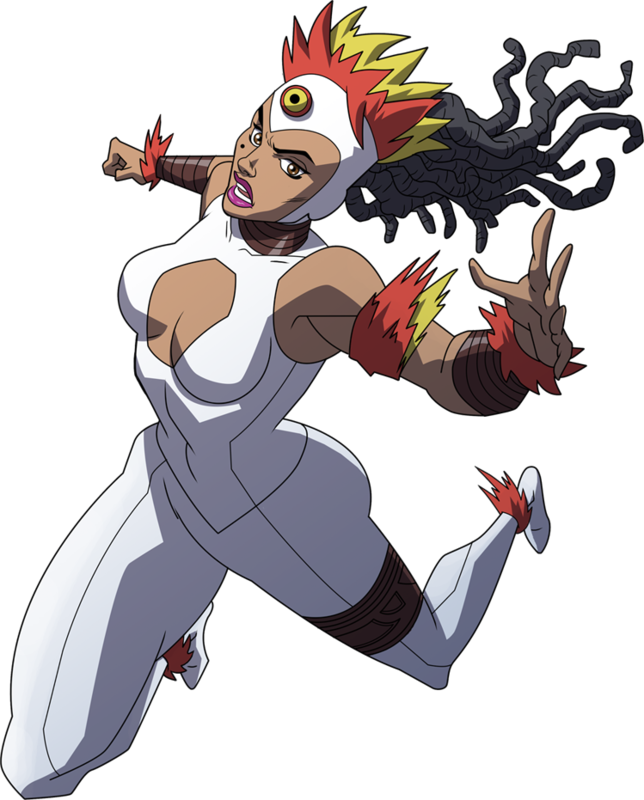 But they broke free of the mind control and after a battle with the powerful Shanga (their former homegirl, who agreed to take money from Ray and turn on her sisters), Kharma and her friends were able to chase Ray and his associates from the lab. They find that Victor Carnel has also been trapped in the lab. Kharma releases him and though he is severely injured from being tortured by his brother, he is able to explain to them what is happening. He first tells them that it is impossible to reverse the effects of the hyper-serum and that they will all permanently have hyper abilities; he then gives them details on the diabolical nature of Edgar Lockhart and Universal Intelligence. Kharma’s fellow Sista Clique member, Crystal, up until now, had been an employee of UI and had had suspicions that the company was dealing in illegal human experimentation. Now, she had the answer AND she had living, breathing proof, as they all turned to see a young woman strapped to a lab table with no less than a hundred wires juiced into her brain… Vic explained that this woman was Ramona and she was a powerful, telepathic hyper-being that Edgar, Reina and Ray had transformed into the most advanced artificial intelligence unit in the world. Kharma immediately recognized Romana… She’d previously been one of her dancers in the Celestial Creatures performance troupe, but had suddenly come up missing just a couple of weeks after being hired. Now, she knew why she had gone missing and what had happened to her. Kharma vowed to go after Ray and make him pay for all of his evil deeds. She was determined. But Vic did not think that was such a great idea. In fact, he suggested Kharma, specifically, get as far away from Ray, Reina and Edgar as possible. For she had something the villains would do anything to get their hands on – a powerful telepathic mind.